Everyone loves a good pinterest find, right? And these days, that's exactly where most of us turn when we are needing something festive to make for a holiday dish or a DIY project. I knew the 4th was coming up, and we had plans to go to the lake to celebrate with family. There are quite a few young-ins under the age of 18 that attend. So I knew I wanted to make something that they would enjoy for dessert. 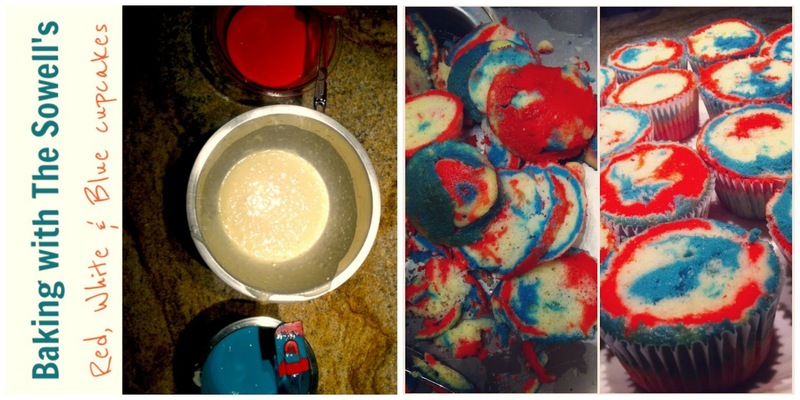 You've heard of pinterest fails, right? Well, this isn't one of them. Instead, this is what happens when you mix a great idea with a limited time frame and an ambitious baker. Yeah, after that statement you KNOW Cupcakes Wars will NOT be knocking on my door anytime soon. First, I have to say that the cupcakes were a hit. We didn't bring any home with us from the lake because they were all engulfed that afternoon. So that means I must have done something right. Preheat the oven to 350°. Mix the cake mix according to the directions on the box. Place one third of the batter in three separate bowls. I went with the theme red, white and blue... but you can use any color combinations you want. Just put a few drops of food coloring each bowl with cake batter and mix well. Line your muffin pan with cupcake liners and start dropping some of each batter in the liners. NOTE: DO NOT OVER FILL THE CUPCAKE LINERS. However, if this happens, just cut the tops off of the cupcakes. This was the mistake I made. I really got carried away when filling the liners and when my cupcakes came out of the oven, well, they were more like muffins. Beat cream cheese and butter until smooth. Add vanilla and slowly add powdered sugar until you reach your desired consistency. 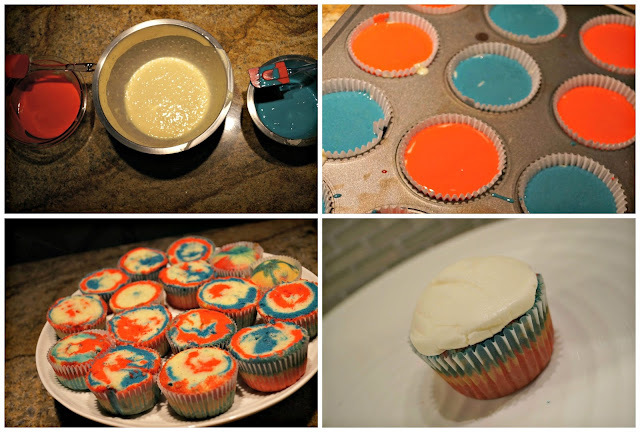 Pipe your frosting onto the cupcake. I tried to double my frosting recipe, however I wasn't paying much attention and I didn't get the consistency that I wanted. The frosting turned out to be more like fondant. — not the Gigi's tower of icing cupcake like I wanted. Ha! 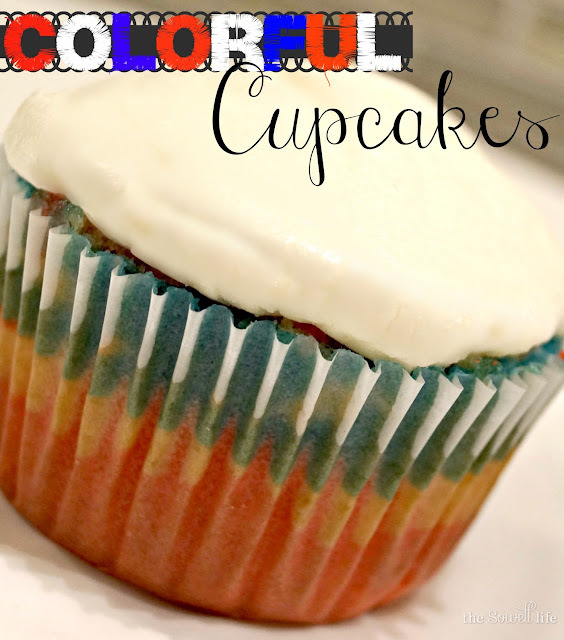 The most important thing to remember when making these cupcakes is to H A V E F U N! I think the Mr and I laughed more than we ever have while frosting the cupcakes. And that, my friends, is what makes lasting memories in the kitchen! Wow! Too easy! I thought it was going to be harder to get the swirl of colors! Definitely pinning this for future parties! Thanks! What would we do without Pinterest? I would eat at least four. I am still amazed with these cupcakes! So patriotic! Those turned out so awesome! I might have to try them next 4th! Great idea! I've done rainbow cupcakes but hadn't' even thought to do red,white & blue ones! Lordy Lordy, my husband is FORTY!